New Orleans is often thought of as thee place to be on Mardi Gras. Yes, there’s reason for this, and it’s probably worth all of our while to at some point in our lives take in the Big Easy, at least once. There’s a website to plan for next year, and you can also tune in to Mike Rowe to see exactly how a krewe puts a float together, a tutorial on the specialized technique of inflating cow bladders to bang on said float and all. Calvin Trillin has a glimpse into Mardi Gras circa 1968 here. And apparently there are at least 5 big myths swirling around in non-New Orleans, one of which covers the truth and facts about momentarily disrobing at Mardi Gras. The bottom round beef roast can be more sensibly priced than the skirt steak in northern Dakota. This may have to do with Bourdain, or due to the fact that there are not an abundance of French butchers, circa 2012, in the Red River Valley. As a type of capstone to a localized Mardi Gras in Fargo (culture is portable, folks), we prepared a bunch of food. And it turns out that I didn’t even mean for this meal to coincide with the new moon in February, and it was only an after-the-2-day-marinating-started-thought that I asserted that the meal had original Mardi Gras intentions. Either way, I don’t think anyone cared. Just cook the food. We’re hungry. The two dishes prepared were a shrimp-rice jambalaya, and marinated and grilled steak. 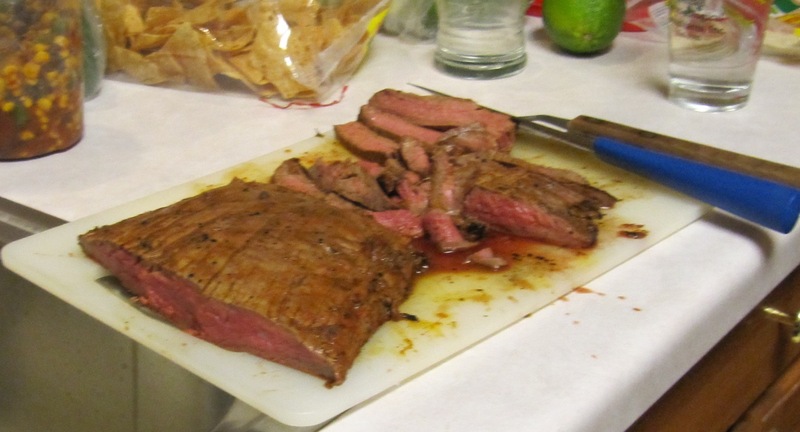 The latter recipe made its way into my brain via Rick Gion, who marinated and grilled a skirt steak for beef fajitas. It was delicious. After discussing pricing with Gion, I wondered if Tony Bourdain’s nod to and popularization of hanger, skirt and flank steaks has driven up the price? 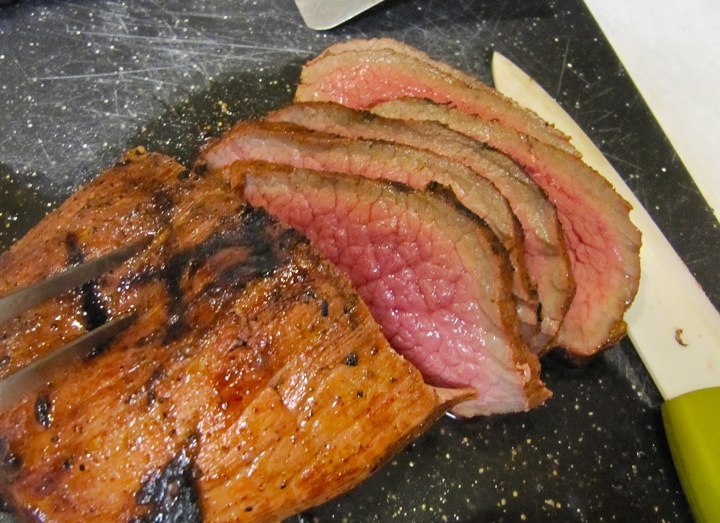 Locally, in Fargo, skirt steak can go for something like $8.00/pound. For the Tuesday meal, I decided to get a chunk of bottom round beef roast, slice it in half, and then marinade it in an equatorial spice, lime and beer blend (the recipe is a variation on this). It turned out tender, but not as tender as the skirt steak Gion brought over a couple nights ago. The skirt steak from a couple nights prior. This entry was posted on Wednesday, February 22nd, 2012 at 8:30 am	and posted in Uncategorized. You can follow any responses to this entry through the RSS 2.0 feed.